SHIPPING TODAY! 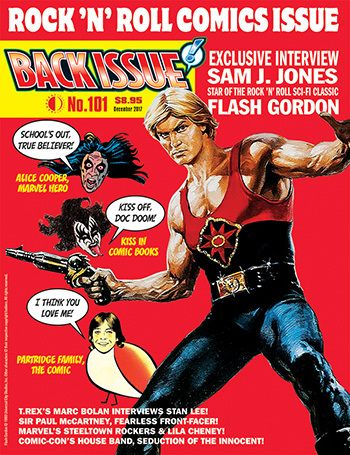 Back Issue #101 is our Rock ’n’ Roll Comics Issue, featuring an exclusive interview with Sam J. Jones, star of the rock/sci-fi classic, Flash Gordon. Plus: KISS in comics, Marvel’s Alice Cooper, T. Rex’s Marc Bolan’s interview with Stan Lee, Sir Paul McCartney: Fearless Front-Facer, Charlton’s Partridge Family, David Cassidy, and Bobby Sherman comics, Marvel’s Steeltown Rockers, Lila Cheney and Hypno-Hustler, the Monkees’ comic connections, superheroes’ favorite bands, and Comic-Con’s house band, Seduction of the Innocent. Featuring Amy Chu, Max Allan Collins, Jack Kirby, Angel Medina, Bill Mumy, Don Sherwood, Alan Weiss, and others! 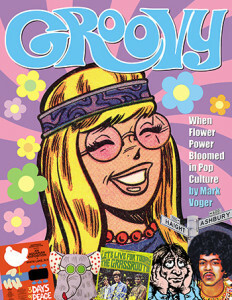 It’s edited by Michael Eury, and you can see a free preview and order HERE! This entry was posted in TNT on 31 October 2017 by Mr. Morrow. Get 50% off during Sale O’Ween! Here’s the trick: If a PRINT edition is available, it’s half-price (with a free digital edition). And if an item is ONLY available in Digital form, it’s also 50% OFF (as low as 98¢ each)! But this sale ends at the stroke of Midnight on October 31! Find the full list HERE! And while you’re at it, don’t forget to pre-order IT CREPT FROM THE TOMB (our second “Best of” collection of the acclaimed magazine on the history of horror comics), at 15% off. It ships in January, and can be ordered HERE! This entry was posted in TNT on 25 October 2017 by Mr. Morrow. 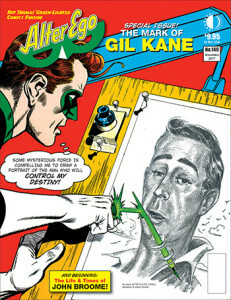 The mark of GIL KANE, comics legend, is all over ALTER EGO #149, now on sale. 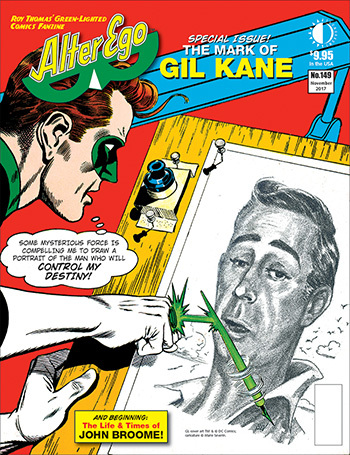 I recall hearing Gil on National Public Radio right after Jack Kirby died in 1994, talking about Jack’s influence on comics. 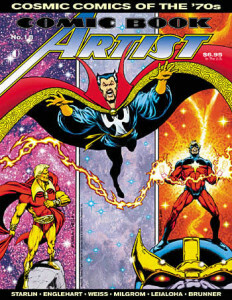 This issue has his remarkable article from the April 1974 edition of The Harvard Journal of Pictorial Fiction, where he waxes on about Kirby as well as Hal Foster, Frank Frazetta, Winsor McCay and others. Preview that Kane article at the 13th Dimension website by clicking HERE. #149 also features the beginning of our serialization of the autobiography of Golden/Silver Age Flash/GL scripter John Broome. The issue’s shipping now, and in stores tomorrow. You can order and see a preview of the full issue HERE. This entry was posted in TNT on 24 October 2017 by Mr. Morrow. Only a few hours left for 40% OFF! It’s the FINAL DAY of TwoMorrows Publishing’s 40% OFF New York Post-Sale! 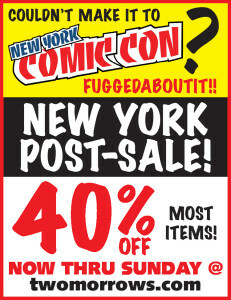 Just like our booth at last week’s NYCC, this ends promptly at 5pm EST today! So you’ve only got a few hours left to save big on most of our comics and Lego publications! This entry was posted in TNT on 15 October 2017 by Mr. Morrow. Thanks to our current 40% OFF New York Post-Sale, Comic Book Artist #18 just sold out in print form (only the digital edition is available). 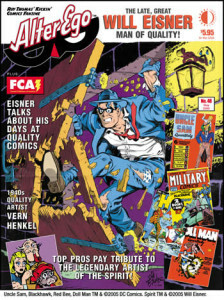 But we also just found a handful of copies of the previously sold out Alter Ego #48, spotlighting Will Eisner. So if you missed that issue, get it quick while it’s back in stock, at 40% Off! This entry was posted in TNT on 13 October 2017 by Mr. Morrow.